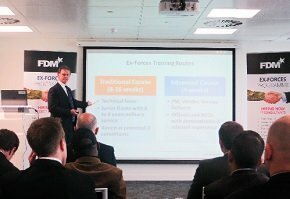 IT service provider FDM Group recently held one of its Insight Days, which aims to recruit ex-military personnel onto its Ex-Forces Programme. Computer Weekly was invited along to the event at the company's London Bridge offices to find out what the programme offers. FDM launched its Ex-Forces UK Programme at the beginning of 2014, after the initiative proved popular at its US office. The UK Ex-Forces Programme offers ex-forces personnel IT training in several business and technical disciplines. The training is followed by commercial experience at FDM for at least two years. The service provider’s Ex-Forces programme is run by a team of ex-military personnel, with the candidates coming from backgrounds in Army, RAF and Navy across all ranks (non-commissioned and commissioned). FDM Group also signed the Ministry of Defence’s Armed Forces Corporate Covenant last year, pledging its commitment to the armed forces community. Reseller CompTIA launches Armed for IT Careers to support ex-military personnel and narrow the skills gap. Vodafone showed a commitment to employing ex-military personnel at an event hosted by minister of state for the armed forces, Mark Francois. The Worshipful Company of Information Technologists aims to unite ex-Royal Signallers with employers looking for IT candidates that can work in high-pressure environments. Stewart Sharman, who heads up the UK programme, was present at the Insight Day to run the candidates through what FDM offers ex-military personnel. Sharman said the programme aims to bridge the gap between the forces and the commercial world and to “get you a job”. “We show you the live opportunities available now. It’s about where you are in the transition and what you want, where you live and your salary expectations,” he said. FDM offers free training, CV and interview preparation, initial two-year employment as an FDM consultant, client placement, ongoing support and pastoral care, two days' paid leave to support military charities, and £170 a week living allowance during the training process. There are two tracks for training. Salaries for those who complete the traditional course, and are placed onsite at a client, can expect a basic of £18,000; the advanced course has a basic of £34,000. Sharman said: “Even if you don’t think you’re technical, you can still play a role with your transferable skills. To lead and understand a team you don’t have to be an IT expert. Training on this course includes professional skills and commercial awareness, SQL and Excel VBA, Morex and production support in addition to training in data analysis, project support, business analysis and business test analysis. The advanced course runs for four weeks and is aimed at those wanting to be project managers, part of help desk service and delivery roles that manage stakeholders. It is aimed at officers and non-commissioned officers (NCOs) with demonstrable and relevant experience. “We have junior officers apply with three to four year experience or some senior positions with up to 36 years’ experience,” added Sharman. The training includes professional skills and development, an introduction to financial markets, practical application of project management through case studies and exercises, in addition to learning presentation skills, Prince2 and agile, service delivery modules, Microsoft Excel, Microsoft Visio, Microsoft Project and Microsoft PowerPoint. FDM Group recently created a cyber security course in response to demand for skills in the market. All courses are delivered through the FDM Academy. Currently ten ex-forces personnel are employed at FDM Group. Forty eight have taken the advanced course and 32 have taken the traditional. Seventy candidates are currently placed onsite with clients such as HSBC, UBS, Virgin Media, SSE and Lloyds Banking Group. Speaking at the Insight Day was Travis Broad who recently went through FDM’s Ex-Forces Programme. He joined FDM after a seven-year career in the British Army’s Parachute Regiment. Broad undertook three operational tours in Iraq and Afghanistan and worked as an interpreter, mediating discussions and commanding multicultural teams. After leaving the forces Broad worked for XMR – formerly Jobs in ICT – a recruitment company specialising in ex-military personnel. He later met FDM at a networking event and was encouraged to attend one of the company’s Insight Days. One week later he had an interview arranged for him, through FDM, with Lloyds Banking Group for the position of release manager. Soon after Broad started his training at the FDM Academy focusing on financial industry awareness training and systems such as Prince2 and ITIL. He has now been placed onsite at Lloyds Banking Group and is learning the ropes of being a manager there. The FDM Group ex-forces team is spread across locations in London, Manchester, Glasgow and soon in Leeds. As a whole FDM Group employs up 1,000 graduates a year with over 32,000 applying for positions.